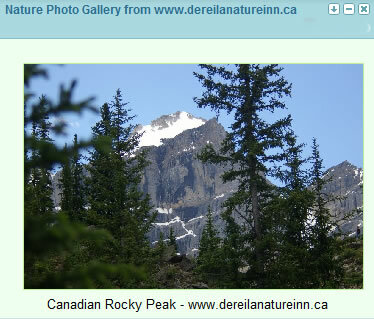 Welcome to May's issue of the Dereila Nature Inn newsletter. 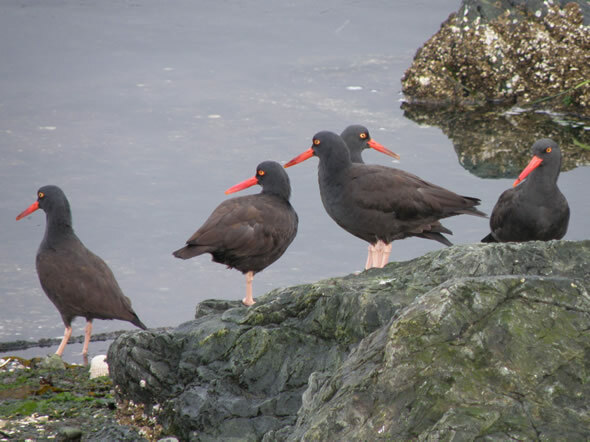 Five Black Oystercatchers celebrate our newsletter's 5th anniversary this month. 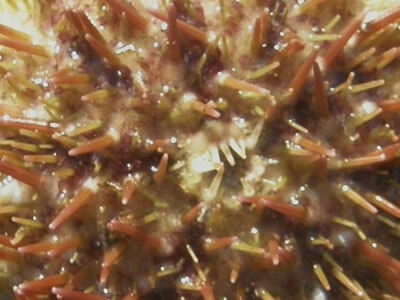 Welcome to the 5th anniversary issue of Whispers, the newsletter of the Dereila Nature Inn - your virtual nature centre. We cannot believe that these five years have gone by already. We've had so many great photo submissions and contributions over the years, plus lots of jokes, trivia and tips. We really appreciate this opportunity to celebrate nature and photography with you. Thanks for all of your support, encouragement and ideas. 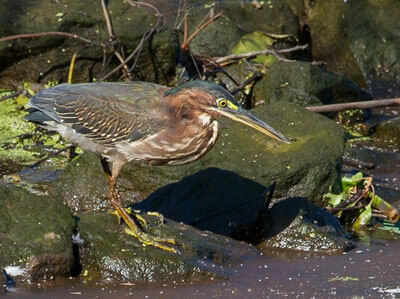 May is a wonderful month for birders. 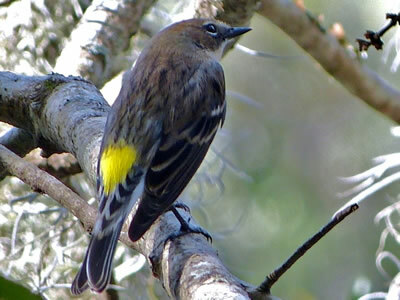 Many birds have returned from their winter places and are nesting and millions of others are taking part in the great migration - moving across North America, stopping along to way to feed and rest before continuing on their way to the far north. We hope you get a chance for some great encounters! In the late 1800s the United States started a new celebration. A name and a date were selected and since then 35 other countries have joined in celebrating in their own way. What is the event? Come on down to Arizona and explore this amazing desert place. 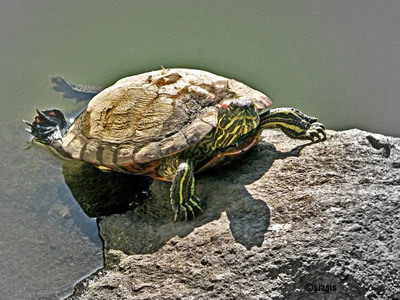 Our 4th annual Earth Day celebration has a fantastic collection of nature pictures that were submitted. 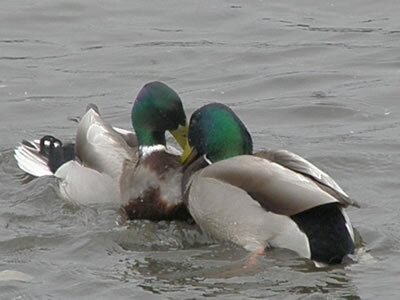 We have added four more information pages to this series: The Ring-necked Duck; The Dunlin; The American Coot and the White-fronted Goose. We invite you to submit nature photographs to this section. We hope you enjoy this month's terrific selection. 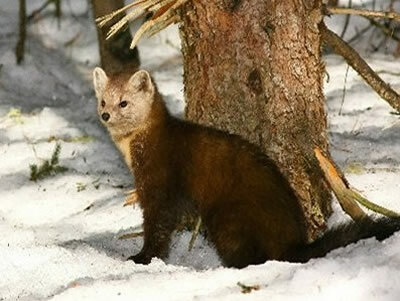 Rare shot of a Pine Marten, also from Frank and Sandra Horvath. Thank you everyone for the amazing photographs! This month's selected page the Wildflower Garden. This is the opening page to the section at the Nature Inn that explores wildflowers. Here you'll find links to our At-A-Glance Guides to Wildflowers, the Wildflower of the Month, Wildflower Crosswords and Jigsaws as well as informative articles and features. Visit the page by clicking here. Our wandering image is actually a series of images this month. waiting and watching for some development, we were rewarded. 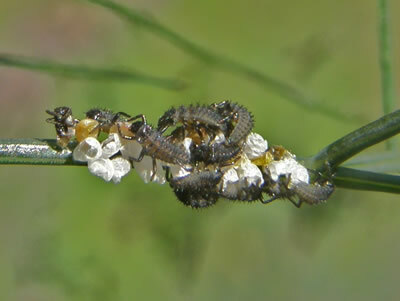 The hatchlings finally emerged - tiny black beetles. 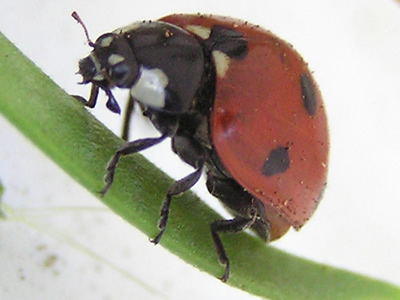 A proud day for Momma Lady Bug! Number one: "Hey! I saw her first!" Number two: "Oops! Sorry! I thought there was a mirror." 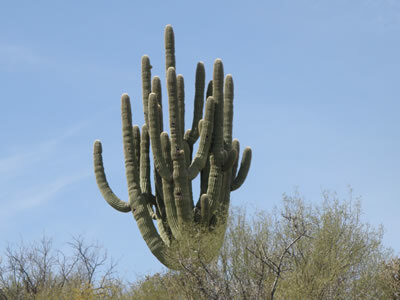 The Arizona-Sonora Desert Museum in Tucson, AZ, has an amazing variety of desert plants and wildlife. It's a great place for the nature photographer to get new images as well as learn about the desert. 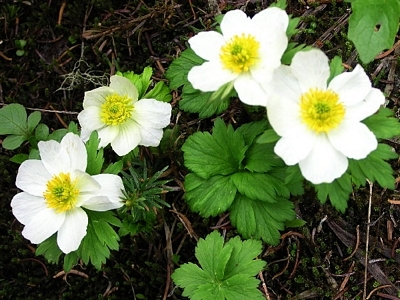 The scientific name of the Globeflower is Trollius albiforis. The genus name Trollius is believed to be named after the supernatural Swedish Troll, perhaps because the plant contains some rather poisonous substances. 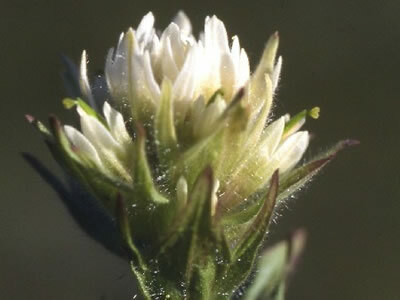 The species name is very straightforward: Albi = white and floris = flowers, and this plant certainly has beautiful white flowers. 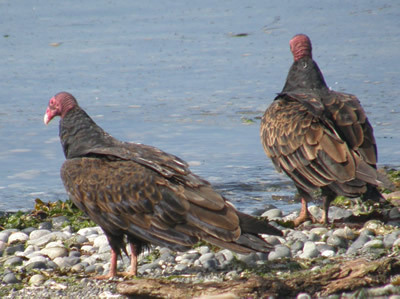 Two vultures were flying over Wales. As they were approaching the town of Llanfairpwllgwyngyllgogerychwyrndrobwlllantysiliogogogoch, they started arguing about the pronunciation of the town's name. They argued back and forth until they stopped for lunch. As they stood at the counter of a fast-food restaurant, one of them decided to ask the Welsh employee. "Before we order, can you settle an argument for us? Can you please pronounce where we are - very slowly?" The girl leaned over the counter and said, "MMMaacccDDDonnaalddd's." "Oh, don't sulk. I'll ask next time." 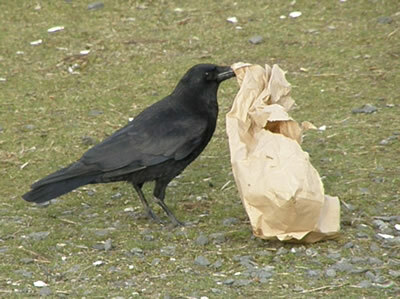 Sadly, inquisitive birds and beasts are often attracted to garbage. So please do a double check around when you're in an area of beauty and take away any garbage, even if it's not yours. It's for the good of all. 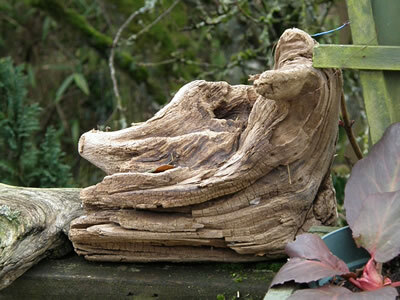 A popular bird feeder is a simple log with a few holes drilled into it which you can stuff with suet. Another alternative which can provide better nature-like images is a part of an old tree like this one. 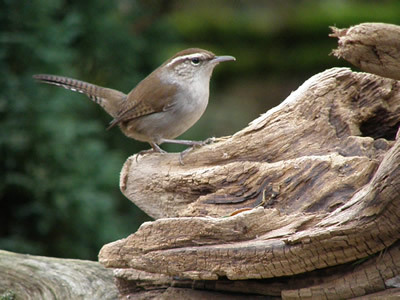 Just fasten it down with some wire or string in an easy viewing area on your bird feeding station. 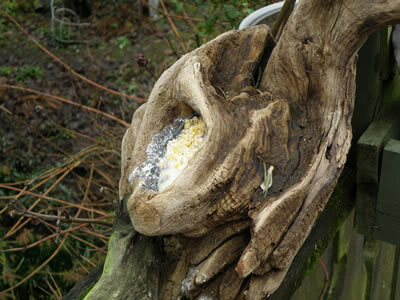 Fill in one or two of the cracks or depressions with your suet mix. 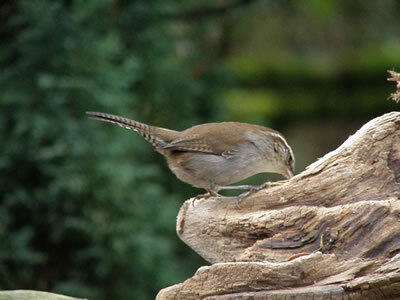 This Bewick's Wren quickly found the hidden tasty delight! 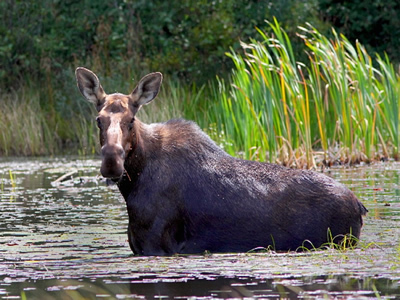 Now you have plenty of time to get some great looking nature photos! 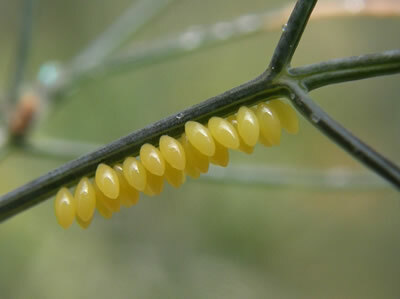 Many thanks to everyone who sent in photographs to celebrate Earth Day 2012. We are thrilled with the results. You can see the page by clicking here. Thanks once again for supporting this annual project! 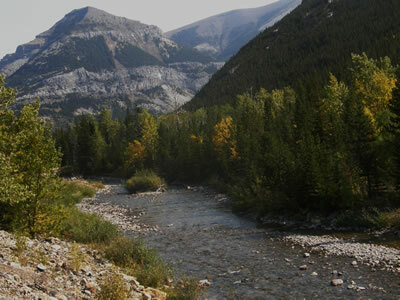 In southwestern Alberta, the Belly River flows through the eastern part of Waterton Lakes National Park. It actually starts south of the border in Montana's Glacier National Park. The two parks are an International Peace Park and recognized by the United Nations as a World Heritage site. You can take our photographic tour of Waterton by clicking here. 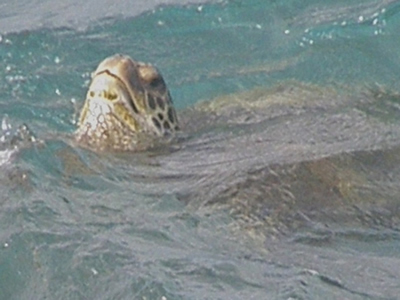 Did you know that the Green Sea Turtle is the official reptile of Mexico? 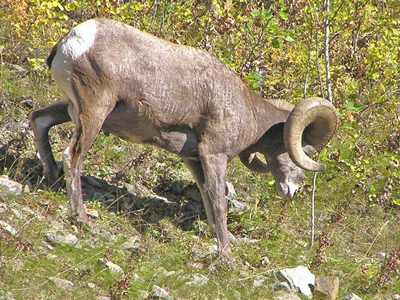 The Rocky Mountain Bighorn Sheep is the official mammal of Alberta and Colorado. Nevada has chosen a subspecies, the Desert Bighorn Sheep. A total of 43 provinces and states have selected official mammals. You can see our collection by clicking here. You'll notice that we are missing a few images, so if you can help out and provide a photo for the page, please e-mail us. We'd love to get that page completed! 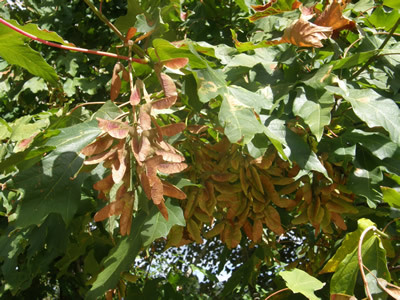 The United States started the tradition of Arbor Day - celebrated there on April 27. In many countries it's called National Tree Planting Day. Did you plant a tree?! It's not too late! 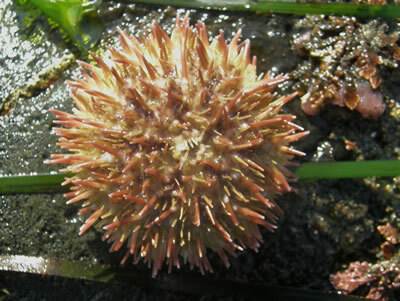 Our mystery image is a Green Sea Urchin, Strongylocentrotus droebachiensis. Watch for the next issue of Whispers in your inbox during the first week of June. See you then!